Today's defence related news includes 'Troops to Teachers' and the new Military Mental Health Helpline. The Sunday Times published an exclusive piece on a new £40,000 bursary for ex-service personnel to retrain as a teacher. From September, courses at universities nationwide will offer the incentive to veterans who have left full-time employment in the British Army, Royal Air Force or Royal Navy in the last five years, or anyone leaving before training begins. The scheme will be formally announced this week. Through leadership, teamwork and problem solving, veterans are ideally suited for a career in teaching once they leave the Armed Forces. The Mail on Sunday has followed up on the launch of the new Military Mental Health Helpline last week. The newspaper reports that the helpline has been receiving up to 70 calls per day from serving personnel and their families. The new helpline has already been called around 300 times, showing how important it is. I am determined to work with all the services to ensure every one of our brave men and women knows that we are here for them when they need us the most. 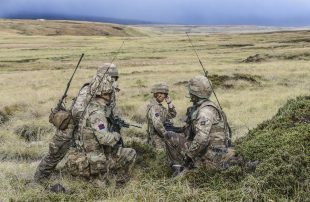 Pictured during a lull in the exercise, are troops from The Household Division, training thousands of miles from home on the infamous Onion Ranges in the Falklands.